Discover Nepal with experienced Sherpa guides! As Sherpas, we were born in the lap of Mother Goddess "Chomolungma" (Mount Everest). Our company has many years of experience in organizing and operating treks and expeditions in the Himalaya. 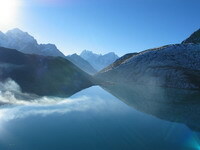 Discover with us the amazing scenery of the Himalaya, the world's highest mountain range. Follow the footsteps of Sir Edmund Hillary and Tenzing Norgay who were the first to climb the world's highest mountain - the Mt. Everest (8,844m). Trek in the Annapurna region, one of the most popular trekking regions in the world with twelve peaks higher than 7000m. We are specialized in tailor-made trekking tours and travel holidays for groups and individuals. All our trekking tours are time-tested and will ensure you get the most out of your stay in Nepal. Our excellent record of customer satisfaction and our success in overcoming challenging situations has led us to expand our range of services. Our company not only offers a variety of trekking programs but also sightseeing tours, jungle safaris, and white water rafting. 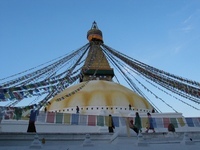 In addition, we also organize tours to Tibet, Bhutan, and India. Come to Nepal for a trip of a lifetime!